Again, thanks to Amy of Amy's Creative Side for organizing the Spring 2015 Blogger's Quilt Festival. 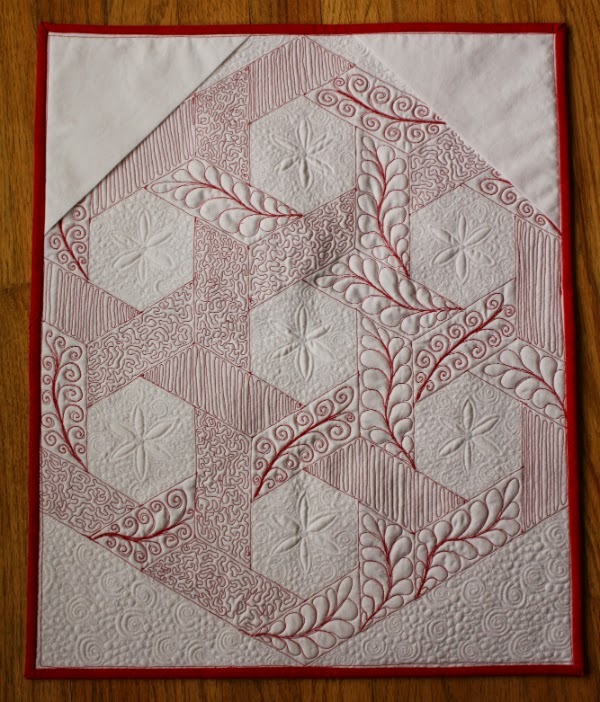 My second entry for the festival is the quilt I made for a private swap with Renee of Quilts of a Feather, which I am entering into the Home Machine Quilted category. The quilt top was all sewn together by hand, using english paper piecing. You can read about the inspiration for the quilt, and see the beautiful quilt Renee made for me, in my previous post, here. 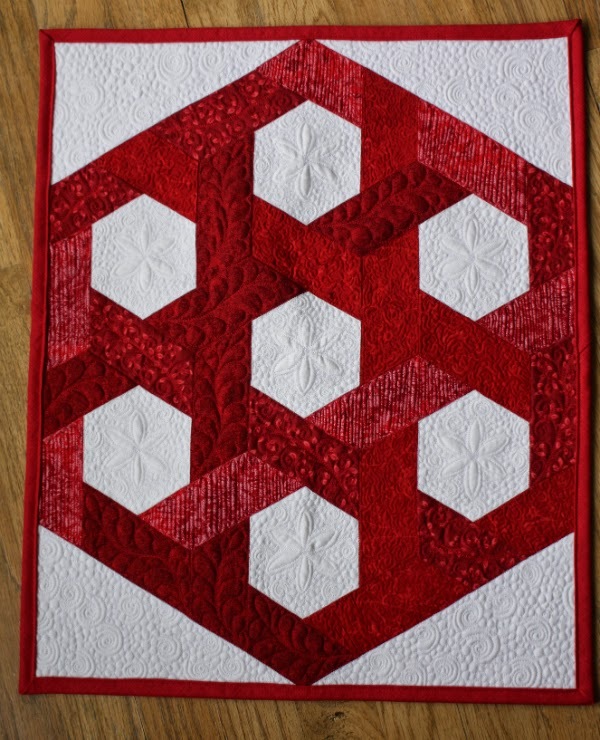 I loved planning the quilting for this one (as I seem to love it for all my quilts lately!). I will admit I was a little stumped by the corner triangles for a little while though. At first I wanted to put a flower in each corner, or even part of a flower, but it just didn't seem to work. Once I settled on just pebbles and swirls I was good to go! 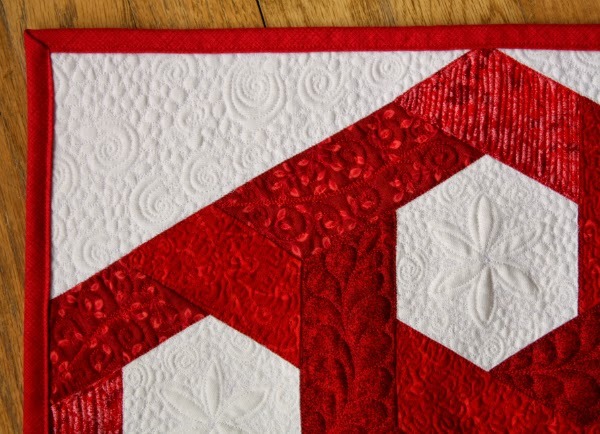 Even though every little wobble shows up with the red thread on the solid white backing fabric, I do love how all of the quilting stands out so much on the back. Thanks for stopping by to see my entry. 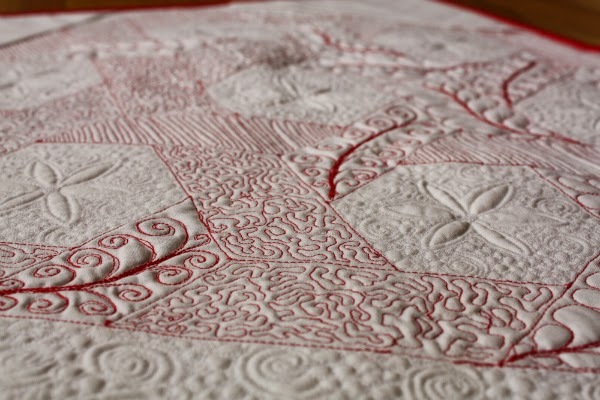 Be sure to check out all the other entries in the Festival...there's a lot of quilty inspiration there! It's lovely! And those wobbles really aren't that noticeable! I love how striking the red thread is. Wobbles (which I can't see) only show it is handmade. Pebbles, feathers, swirls, daisies, so many exquisite elements! Beautiful work! Leanne, you make it look so easy. Gorgeous stitches! You combined my favorites so wonderfully!! !